A backed up sewer line, a burst pipe, a roof leak, a faulty appliance, or a clogged toilet. Each is equally devastating and each can strike without warning: 24 hours a day, 7 days a week, 365 days a year. Because of this, you need a fire damage and water damage restoration company that is not only highly skilled but also available 24 hours a day, 7 days a week, 365 days a year. You need ServiceMaster of LincolnPark Chicago. Water damage does not always happen between 9 am and 5 pm. So why should you rely on a water damage restoration company that is only available between those times? ServiceMaster of Lincoln Park Chicago is available when you need us. We promise to have a technician at your home within hours of your initial call, no matter the time of day. Remember, time is of the essence when it comes to water damage. The longer standing water is left unattended, the more damage it can cause. The damage can spread and lead to other issues, including mold and mildew, which are not only a threat to your home but also your health and the health of your loved ones. “Mold can lead to a variety of health effects ranging from more common allergic reactions to asthma attacks, and hypersensitivity pneumonitis,” according to the Environmental Protection Agency (EPA). Additional health issues include wheezing, coughing, and difficulties breathing; sore throat; sinus congestion; skin irritation and rash; vomiting; pulmonary hemorrhage; memory loss; liver damage; and more. As you can see, timely water damage restoration is extremely important. And it should only be done by skilled, certified professionals, like the ones at ServiceMaster of Lincoln Park Chicago. We are an IICRC Certified company. “All IICRC-certified professionals have the training and experience to identify moisture sources, evaluate mold growth (visible or suspected), contain damage, remove contamination and dry materials to ensure that mold will not return,” according to IICRC.org. 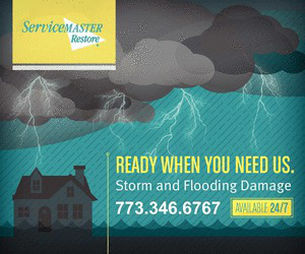 If you have any questions about Water Damage Restoration or Fire Damage Restoration, please contact ServiceMaster of Lincoln Park Chicago by calling 773-346-6767 or contact us today! Follow us on Facebook and Twitter as well! With over 60 years of experience in helping individuals and families like you with flood restoration, we are the best choice for the job.